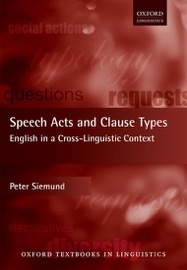 Siemund, Peter (2018) Speech Acts and Clause Types. English in a Cross-Linguistic Context. Oxford: Oxford University Press. 429 pp. Siemund, Peter (2013) Varieties of English: A Typological Approach. Cambridge: Cambridge University Press. 308 pp. (Hardback/Paperback). Siemund, Peter (2013) Pronominal Gender in English. 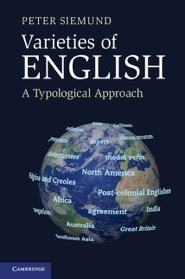 A Study of English Varieties from a Cross-Linguistic Perspective. London: Routledge. 291 pp. Paperback edition. Siemund, Peter, Julia Davydova and Georg Maier (2012) The Amazing World of Englishes. A Practical Introduction. Berlin: Mouton de Gruyter. 283 pp. 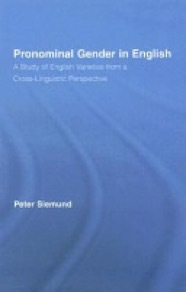 Siemund, Peter (2008) Pronominal Gender in English: A Study of English Varieties from a Cross-Linguistic Perspective. London: Routledge. 291 pp. Siemund, Peter (2000) Intensifiers in English and German. A Comparison. London: Routledge. 283 pp. Siemund, Peter and Jakob Leimgruber (eds.) (in prep.) Multilingual Global Cities: Singapore, Hong Kong, and Dubai. Singapore: Routledge. Multilingual Asia series. Bonnet, Andreas and Peter Siemund (eds.) (2018) Foreign Language Education in Multilingual Classrooms. Amsterdam: Benjamins. Siemund, Peter, Ingrid Gogolin, Monika Schulz and Julia Davydova (eds.) (2013) Multilingualism and Language Contact in Urban Areas. Acquisition – Identities – Space – Education. Amsterdam: Benjamins. Siemund, Peter (ed.) 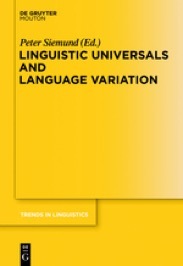 (2011) Linguistic Universals and Language Variation. Berlin: Mouton de Gruyter. Siemund, Peter and Noemi Kintana (eds.) (2008) Language Contact and Contact Languages. Amsterdam: Benjamins. Radden, Günter, Klaus-Michael Köpcke, Thomas Berg and Peter Siemund (eds.) (2007) Aspects of Meaning Construction. Amsterdam: Benjamins. Hole, Daniel and Peter Siemund (eds.) (2006) Operations on Argument Structure. Special issue of Linguistics 44:2 (2006). Siemund, Peter (ed.) (2000) Methodology in Linguistic Typology. Zeitschrift für Sprachtypologie und Universalienforschung (STUF) 53 (2000) 1. Journal of Language Contact, Co-Editor-in-Chief, Leiden: Brill. Editorial Manager. Siemund, Peter and Ingrid Gogolin (2010-) Hamburg Studies on Linguistic Diversity. Amsterdam: Benjamins. Siemund, Peter, Christoph Gabriel and Barbara Hänel-Faulhaber (2008-2010) Hamburg Studies on Multilingualism. Amsterdam: Benjamins. Lorenz, Eliane, Richard Bonnie, Kathrin Feindt, Sharareh Rahbari, and Peter Siemund (2018) ‘Cross-linguistic influence in unbalanced bilingual heritage speakers on subsequent language acquisition: evidence from pronominal object placement in ditransitive clauses’. International Journal of Bilingualism. Leimgruber, Jakob, Peter Siemund and Laura Terassa (2018) ‘Singaporean students’ language repertoires and attitudes revisited’. World Englishes 37, 282-306. DOI: 10.1111/weng.12292..
Siemund, Peter (2017) ‘Interrogative clauses in English and the social economics of questions’. Journal of Pragmatics 199, 15-32. DOI 10.1016/j.pragma.2017.07.010. Siemund, Peter (2016) ‘The mutual relevance of typology and variation studies’. Linguistic Typology 24, 521-536. DOI 10.1515/lingty-2016-0024. Siemund, Peter (2015) ‘Exclamative clauses in English and their relevance for theories of clause types’. Studies in Language 39:3, 697-727. Siemund, Peter (2015) ‘Review of Imperatives by Mark Jary and Mikhail Kissine. Cambridge: Cambridge University Press 2014’, Linguistics 53:4, 931-943. Lechner, Simone and Peter Siemund (2014) ‘Double Threshold in bi- and multilingual contexts: Preconditions for higher academic attainment in English as an additional language’. Frontiers in Psychology 5:546. doi: 10.3389/fpsyg.2014.00546. Siemund, Peter, Monika Edith Schulz and Martin Schweinberger (2014) ‘Studying the linguistic ecology of Singapore: A comparison of college and university students’. World Englishes 33:3, 340–362. Siemund, Peter (2014) ‘The emergence of English reflexive verbs: An analysis based on the Oxford English Dictionary’. English Language and Linguistics 18:1, 49–73. Siemund, Peter and Florian Dolberg (2011) ‘From lexical to referential gender: An analysis of gender change in medieval English based on two historical documents’, Folia Linguistica 45/2, 489–534. Siemund, Peter (2010) ‘Grammaticalization, lexicalization and intensification. English itself as a marker of middle situation types’, Linguistics 48:4, 797-836. Siemund, Peter and Alexander Haselow (2008) ‘Newfoundland English morpho-syntax: Universal aspects and trends’, Anglistik: International Journal of English Studies 19:2, 201-213. Gast, Volker and Peter Siemund (2006) ‘Rethinking the relationship between self-intensifiers and reflexives’, Linguistics 44:2, 343-381. Siemund, Peter (2003) ‘Review of Anaphora by Yan Huang. Cambridge: Cambridge University Press 1999’, Language 79, 634–638. Siemund, Peter (2002) ‘Mass versus count: Pronominal gender in regional varieties of Germanic languages’, Zeitschrift für Sprachtypologie und Universalienforschung (STUF) 55 (2002) 3, 213-233. Siemund, Peter (2002) ‘Review of A History of English Reflexive Pronouns: Person, Self, and Interpretability by Elly van Gelderen. Amsterdam: Benjamins 2000’, Studies in Language 26, 469–476. Siemund, Peter (2002) ‘Reflexive and intensive self-forms across varieties of English’, Zeitschrift für Anglistik und Amerikanistik (ZAA) 50 (2002) 3, 250-268. Siemund, Peter (2001) ‘Review of Emerging English Modals. A Corpus-Based Study of Grammaticalization by Manfred G. Krug. Berlin/New York: Mouton de Gruyter 2000’, Zeitschrift für Anglistik und Amerikanistik. König, Ekkehard and Peter Siemund (2000) ‘The development of complex reflexives and intensifiers in English’, Diachronica XVII, 39-84. König, Ekkehard and Peter Siemund (2000) ‘Locally free self-forms, logophoricity and intensification in English’, English Language and Linguistics 4.2, 183-204. Siemund, Peter (2019) ‘Englisch als weitere Sprache im Kontext herkunftsbedingter Mehrsprachigkeit’, in: Joana Duarte, Ingrid Gogolin, Thorsten Klinger, Birger Schnoor, and Marina Trebbels (eds.) Sprachentwicklung im Kontext von Mehrsprachigkeit – Hypothesen, Methoden, Forschungsperspektiven. Wiesbaden: Springer VS.
Lorenz, Eliane and Peter Siemund (2019) ‘The acquisition of English as an additional language by multilingual heritage speakers’, in: Matthias Meyer and Ulrich Hoinkes (eds.) Der Einfluss der Migration auf Sprach- und Kulturräume - The Impact of Migration on Linguistic and Cultural Areas. Bern: Peter Lang. Peter Siemund and Jessica Terese Mueller (2019) ‘Are multilinguals the better academic ELF users? Evidence from a questionnaire study measuring self-assessed proficiencies’, in: Anna Mauranen and Svetlana Vetchinnikova (eds.) Language Change: The Impact of English as a Lingua Franca. Cambridge: Cambridge University Press. Siemund, Peter (2019) ‘Regional varieties of English: non-standard grammatical features’, in: Bas Aarts, Jillian Bowie and Gergana Popova (eds.) Oxford Handbook of English Grammar. Oxford: Oxford University Press. Lorenz, Eliane and Peter Siemund (2019) ‘Differences in the acquisition and production of English as a foreign language. A study of bilingual and monolingual students in Germany’, in: Eva Vetter and Ulrike Jessner (eds.) International Research on Multilingualism: Breaking with the Monolingual Perspective. Berlin: Springer. Siemund, Peter (2018) ‘Modeling World Englishes from a cross-linguistic perspective’, in: Sandra Dehors (ed. ), Modeling World Englishes: Assessing the Interplay of Emancipation and Globalization of ESL Varieties. Amsterdam: Benjamins, 133-162. 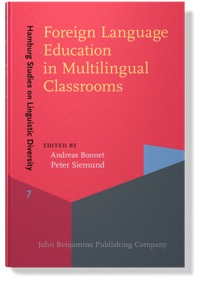 Bonnet, Andreas and Peter Siemund (2018) ‘Multilingualism and foreign language education: A synthesis of linguistic and educational findings’, in: Andreas Bonnet and Peter Siemund (eds.) Foreign Language Education in Multilingual Classrooms. Amsterdam: Benjamins, 1-29. Siemund, Peter, Stefanie Schröter and Sharareh Rahbari (2018) ‘Learning English demonstrative pronouns on bilingual substrate: Evidence from German heritage speakers of Russian, Turkish, and Vietnamese’, in: Andreas Bonnet and Peter Siemund (eds.) Foreign Language Education in Multilingual Classrooms. Amsterdam: Benjamins, 381-405. Bonnet, Andreas and Peter Siemund (2017) ‘Teaching and learning English in multilingual settings: Linguistic findings and educational appraoches’, in: Reiner Lehberger (ed.) Kooperationen in der Lehrerbildung. BoD – Books on Demand. Siemund, Peter (2017) ‘English exclamative clauses and interrogative degree modification’, in: Maria Napoli and Miriam Ravetto (eds.) Exploring Intensification: Synchronic, Diachronic and Cross-linguistic Perspectives. Amsterdam: Benjamins, 207-228. Siemund, Peter and Lijun Li (2017) ‘Towards a diachronic reconstruction of Colloquial Singapore English’, in: Debra Ziegeler and Bao Zhiming (eds.) Negation and Contact. With Special Focus on Singapore English. Amsterdam: Benjamins, 11-32. 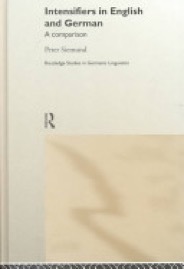 Siemund, Peter and Simone Lechner (2015) ‘Transfer effects in the acquisition of English as an additional language by bilingual children in Germany’, in: Hagen Peukert (ed.) Transfer Effects in Multilingual Language Development. Amsterdam: Benjamins, 147-160. Lechner, Simone and Peter Siemund (2014) ‘The role of language external factors in the acquisition of English as an additional language by bilingual children in Germany’, in: Heli Paulasto, Lea Meriläinen, Helka Riionheimo, and Maria Kok (eds.) Language Contacts at the Crossroads of Disciplines. Cambridge: Cambridge Scholars Publishing. Siemund, Peter and Julia Davydova (2014) ‘World Englishes and the study of typology and universals’, in: Markku Filppula, Juhani Klemola, and Devyani Sharma (eds.) Handbook of World Englishes. Oxford: Oxford University Press. 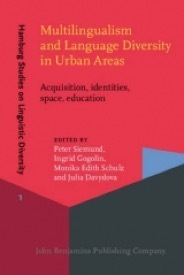 Gogolin, Ingrid, Peter Siemund, Monika Schulz and Julia Davydova (2013) ‘Multilingualism, language contact, and urban areas. An introduction’, in: Peter Siemund, Ingrid Gogolin, Monika Schulz and Julia Davydova (eds.) Multilingualism and Language Contact in Urban Areas. Acquisition – Identities – Space – Education. Amsterdam: Benjamins, 1-15. König, Ekkehard and Peter Siemund (2013) ‘Satztyp und Typologie’, in: Jörg Meibauer, Markus Steinbach und Hans Altmann (eds.) Satztypen des Deutschen. Berlin: Mouton de Gruyter, 846-873. Davydova, Julia, Georg Maier and Peter Siemund (2013) ‘Varieties of English in the EFL classroom setting’, in: Kristin Bührig (ed.) Transferring Linguistic Know-How into Practice: Perspectivas y resultados - Perspektiven und Ergebnisse - perspectives and results. Amsterdam: Benjamins, 81-93. Siemund, Peter and Tatiana Perevozhchikova (2012) ‘Wortarten im Deutschen und im Englischen’, in: Wolfgang Thielmann (ed.) Jahrbuch Deutsch als Fremdsprache 37, 183-208. Siemund, Peter, Georg Maier and Martin Schweinberger (2012) ‘Reflexive and intensive self-forms’, in: Raymond Hickey (ed.) Areal Features of the Anglophone World. Berlin: Mouton de Gruyter, 409-437. Davydova, Julia, Michaela Hilbert, Lukas Pietsch and Peter Siemund (2011) ‘Comparing varieties of English: Problems and perspectives’, in: Peter Siemund (ed.) Linguistic Universals and Language Variation. Berlin: Mouton de Gruyter, 291-323. Siemund, Peter (2011) ‘Universals and variation. An introduction’, in: Peter Siemund (ed.) Linguistic Universals and Language Variation. Berlin: Mouton de Gruyter, 1-20. Siemund, Peter and Kalynda Beal (2011) ‘Clefting in contact through space and time: an analysis of it-clefts in Irish English, Indian English and British English’, in: Raymond Hickey (ed.) Researching the languages of Ireland. Uppsala: Uppsala University Press, 243-267. Siemund, Peter (2009) ‘Linguistic universals and vernacular data’, in: Markku Filppula, Juhani Klemola and Heli Paulasto (eds.) Vernacular Universals and Language Contacts: Evidence from Varieties of English and Beyond. London: Routledge, 321-346. Siemund, Peter, Georg Maier and Martin Schweinberger (2009) ‘Towards a more fine-grained analysis of the areal distributions of non-standard features of English’, in: Heli Paulasto and Esa Penttilä (eds.) Language Contacts Meet English Dialects: Studies in Honor of Markku Filppula. Cambridge: Cambridge Scholars Publishing, 19-46. 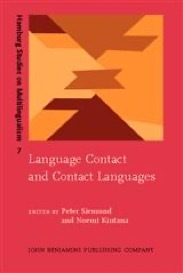 Siemund, Peter (2008) ‘Language contact: Constraints and common paths of contact induced change’, in: Peter Siemund and Noemi Kintana (eds.) Language Contact and Contact Languages. Amsterdam: Benjamins, 3-11. Siemund, Peter and Lukas Pietsch (2008) ‘Contact-induced change and linguistic universals. The case of Irish English’, in: Klaus Stierstorfer (ed.) Proceedings of Anglistentag 2007 Münster. Trier: Wissenschaftlicher Verlag, 369-381. Siemund, Peter (2008) ‘English itself in the middle domain. A corpus-based study of grammaticalization’, in: Gabriele Diewald and Thomas Stolz (eds.) Grammatikalisierung und grammatische Kategorien. Bochum: Brockmeyer, 57-82. Siemund, Peter (2007) ‘Das Reflexivum’, in: Ludger Hoffman (ed.) Handbuch der Wortarten. Berlin: Walter de Gruyter, 707-725. König, Ekkehard and Peter Siemund (2007) ‘Speech act distinctions in grammar’, in: Timothy Shopen (ed.) Language Typology and Syntactic Description. Cambridge: Cambridge University Press, 276-324. 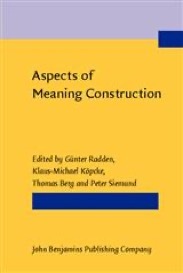 Radden, Günter, Klaus-Michael Köpcke, Thomas Berg and Peter Siemund (2007) ‘The construction of meaning in language’, in: Günter Radden, Klaus-Michael Köpcke, Thomas Berg and Peter Siemund (eds.) Aspects of Meaning Construction. Amsterdam: Benjamins, 1-15. Siemund, Peter and Daniel Hole (2006) ‘Introduction: Operations on argument structure’, special issue of Linguistics 44:2, 203-216. Siemund, Peter (2006) ‘Independent developments in the genesis of Irish English’, in: Hildegard Tristram (ed.) The Celtic Englishes IV. Potsdam: Universitätsverlag, 283-305. König, Ekkehard and Peter Siemund (2005) ‘Intensifiers and reflexive pronouns’, in: Matthew Dryer, Martin Haspelmath, David Gil and Bernard Comrie (eds.) World Atlas of Language Structures. Oxford: Oxford University Press, 194-197. Siemund, Peter (2005) ‘Reanalyzing gender markers as mass/count agreement’, in: Elżbieta Górska and Günter Radden (eds.) Metonymy-Metaphor Collage. Warsaw: Warsaw University Press, 223-254. Siemund, Peter (2004) ‘English’, in: Thorsten Roelcke (ed.) Variationstypologie. Berlin: Walter de Gruyter, 1-29. Siemund, Peter (2004) ‘Analytische und synthetische Tendenzen in der Entwicklung des Englischen’, in: Uwe Hinrichs (ed.) Die europäischen Sprachen auf dem Wege zum analytischen Sprachtyp. Wiesbaden: Harassowitz, 169-196. Siemund, Peter (2004) ‘Substrate, superstrate and universal. Perfect constructions in Irish English’, in: Bernd Kortmann (ed.) Dialectology meets Typology. Berlin: Mouton de Gruyter, 401-434. Siemund, Peter (2003) ‘Varieties of English from a cross-linguistic perspective: Intensifiers and reflexives’, in: Britta Mondorf and Günter Rohdenburg (eds.) Determinants of Grammatical Variation. Berlin: Mouton de Gruyter, 479-506. Siemund, Peter (2003) ‘Zur Analyse lokal-ungebundener self-Formen im Englischen’, in: Lutz Gunkel, Gereon Mueller and Gisela Zifonun (eds.) Arbeiten zur Reflexivierung. Tübingen Niemeyer, 219-237. Siemund, Peter (2002) ‘Selber essen macht fett: Zur Syntax und Semantik von adverbialen Intensifikatoren’, in: Mitsunobu Yoshida (ed.) Grammatische Kategorien aus sprachhistorischer und typologischer Perspektive: Akten des 29. Linguisten-Seminars (Kyoto 2001). Hamburg: Iudicium, 187-204. Siemund, Peter (2002) ‘Animate Pronouns for Inanimate Objects. Pronominal Gender in English Regional Varieties’, in: Dieter Kastovsky (ed.) Proceedings of Anglistentag 2001 Vienna. Trier: Wissenschaftlicher Verlag, 19-34. Siemund, Peter (2001) ‘Interrogative constructions’, in: Martin Haspelmath, Ekkehard König, Wulf Oesterreicher and Wolfgang Raible (eds.) 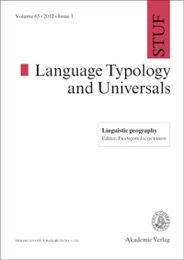 Language Typology and Language Universals. Berlin: Walter de Gruyter, 1010-1028. König, Ekkehard and Peter Siemund (2001) ‘Identität und Alterität: Zur Semantik von fremd und ähnlichen Ausdrücken’, in: Jürgen Trabant and Brigitte Jostes (eds.) Fremdes in fremden Sprachen. München: Wilhelm Fink Verlag, 109-129. Siemund, Peter (2000) Preface to ‘Methodology in Linguistic Typology’, in: Zeitschrift für Sprachtypologie und Universalienforschung (STUF) 53 (2000) 1, 3-4. König, Ekkehard and Peter Siemund (2000) ‘Intensifiers and reflexives: A typological perspective’, in: Zygmunt Frajzyngier and Traci Curl (eds.) Reflexives: Forms and Functions. Amsterdam: Benjamins, 41-74. König, Ekkehard and Peter Siemund (2000) ‘Zur Rolle der Intensifikatoren in einer Grammatik des Deutschen’, in: Rolf Thieroff, Matthias Tamrat, Nanna Fuhrhop and Oliver Teuber (eds.) Deutsche Grammatik in Theorie und Praxis. Tübingen: Niemeyer, 229-245. König, Ekkehard and Peter Siemund (2000) ‘Causal and concessive clauses: Formal and semantic relations’, in: Elizabeth Couper-Kuhlen and Bernd Kortmann (eds.) Cause – Condition – Concession – Contrast. Cognitive and Discourse Perspectives. Berlin: Mouton, 341-360. König, Ekkehard and Peter Siemund (1999) ‘Intensifikatoren und Topikalisierung: Kontrastive Beobachtungen zum Deutschen, Englischen und anderen germanischen Sprachen’, in: Heide Wegener (ed.) Deutsch kontrastiv. Tübingen: Narr, 87-110. König, Ekkehard and Peter Siemund (1999) ‘Intensifiers as targets and sources of semantic change’, in: Peter Koch and Andreas Blank (eds.) Historical Semantics and Cognition. Berlin: Mouton, 237-257. König, Ekkehard and Peter Siemund (1999) ‘Reflexivity, Logophoricity and Intensification in English’, in: Uwe Carls and Peter Lucko (eds.) Form, Function and Variation in English. Studies in Honour of Klaus Hansen. Frankfurt: Lang, 283-304. Siemund, Peter (1998) ‘Reflexivität und Intensivierung: Ein deutsch-englischer Vergleich’, in: Wolfgang Börner and Klaus Vogel (eds.) Kontrast und Äquivalenz. Beiträge zu Sprachvergleich und Übersetzung. Tübingen: Narr, 281-302. König, Ekkehard and Peter Siemund (1997) ‘On the Development of Reflexive Pronouns in English: A Case Study in Grammaticalization’, in: Uwe Böker and Hans Sauer (eds.) Proceedings of Anglistentag 1996 Dresden. Trier: Wissenschaftlicher Verlag, 95-108. König, Ekkehard and Peter Siemund (1996) ‘Emphatische Reflexiva und Fokusstruktur’, in: Inger Rosengren (ed.) Sprache und Pragmatik 40. Lund: Lunds Universitet, 1-42. König, Ekkehard and Peter Siemund (1996) ‘Selbst-Reflektionen’, in: Gisela Harras (ed.) Wenn die Semantik arbeitet. Festschrift für Klaus Baumgärtner. Tübingen: Niemeyer, 277-302. Siemund, Peter (1999) Subjekt-Verb-Inversion im Englischen: Normverletzung oder Ausdrucksgewinn? Fremdsprachen und Hochschule 57, 30-51. Siemund, Peter (1997) Variation on the British Isles (and elsewhere). Hard Times 71, 2-10. Siemund, Peter (2007) Anwendungsorientierte Drittmittelforschung: Das geht auch in den Geisteswissenschaften! Der Transferbereich des Sonderforschungsbereichs 538 Mehrsprachigkeit an der Universität Hamburg. Handbuch Praxis Wissenschaftsfinanzierung. Stuttgart: Raabe Fachverlag für Wissenschaftsinformation. Siemund, Peter (2000) ‘Das deutsche Genus aus der Sicht des Sprachvergleichs’, Kurahei Ogino (ed.) Dokumentation des 28. Linguisten-Seminars, Universität Kyoto. Japanische Gesellschaft für Germanistik. König, Ekkehard and Peter Siemund ‘Intensifiers as targets and sources of semantic change’, in: Klaus v. Heusinger and Regine Eckhardt (eds.) Meaning Change - Meaning Variation. Arbeitspapier Nr. 106 der FG Sprachwissenschaft, Universität Konstanz. König, Ekkehard and Peter Siemund ‘The development of complex reflexives and intensifiers in English’, in: ZAS Working Papers, Zentrum für Allgemeine Sprachwissenschaft, Typologie und Universalienforschung Berlin.